Hundreds of students rallied at Ontario's legislature on Friday calling on Premier Doug Ford to reverse planned cuts to grants for post-secondary education. Organizers of the rally said the Progressive Conservative government's move to eliminate free tuition for low-income students in order to trim a multi-billion-dollar deficit will prevent many from accessing higher education. Hoisting signs and chanting slogans, students argued that many will be saddled with thousands in additional debt without the Ontario Student Assistance Plan grants. But the auditor general found last month that costs for that program jumped by 25 per cent and warned they could grow to $2 billion annually by 2020-21. The government has said the OSAP program has become unsustainable and it is time to refocus it to provide help to students in the most financial need. 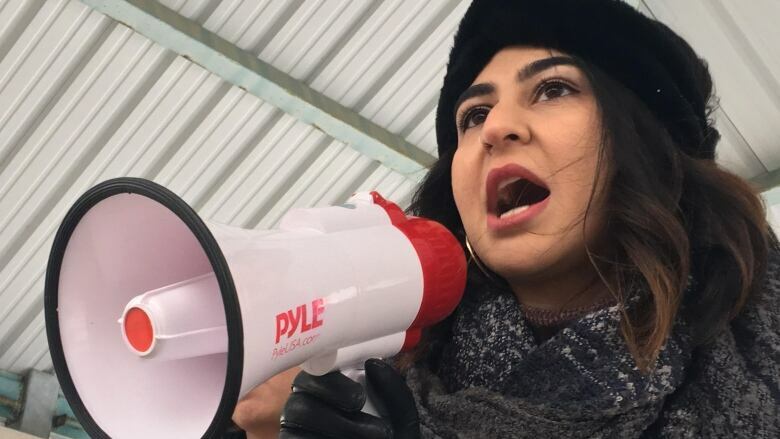 Nour Alideeb, the Ontario chair of the Canadian Federation of Students, said students from the lowest income families will bear the brunt of the cuts to grants. "Our message to the government is you messed with the wrong people," she said. "We're going to be here to make sure that you're actually listening to the people, which are the students, and students want to see a reverse on the OSAP cuts but also public investments into our institutions." The government also said it will cut tuition fees by 10 per cent, saying that will help the students in greatest need, but critics disagree. A 10-per-cent tuition cut would take about $360 million away from universities and $80 million from colleges. NDP leader Andrea Horwath said the government should abandon its plan to cut grants. "This is not the right direction for our province and this government needs to reverse tracks and look towards being more progressive on post-secondary [education]," she said. Stephanie Rea, spokeswoman for the Minister of Training, Colleges and Universities, said the government is committed to ensuring "students receive a high-quality education that helps them succeed in the workforce while obtaining the best value for their money." The Tories are in the midst of trying to trim a deficit they peg at $14.5 billion -- though the financial accountability officer says it's closer to $12 billion. Meanwhile, four online petitions protesting the Ford government's OSAP changes had gathered more than 223,000 signatures by Friday afternoon. Gaelan Kirby, a Carleton University civil engineering student who created one of the petitions, said he wants the government to abandon the policy change, calling it an "irresponsible" move. "When the government says every student matters and they want to make sure all students have access to education I think that's admirable but it does not reflect their actions," he said.